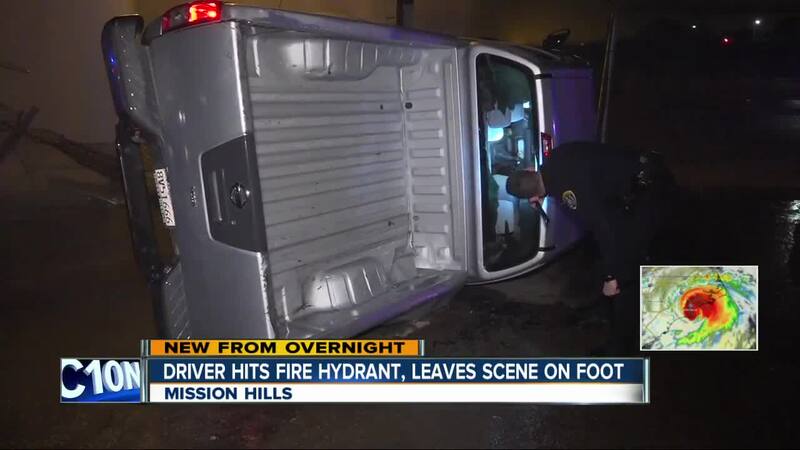 SAN DIEGO (KGTV) - Police are searching for a driver who fled the scene after hitting a fire hydrant that caused a water geyser and flooding in Mission Hills Friday. At around 3 a.m., San Diego police officers responded to a report of a crash at Sutherland Street and Frontage Road. When officers arrived, they saw a sheared hydrant spouting water about 200 feet into the air and water flooding the street. Next to the hydrant was a pickup truck on its side and a knocked-down fence. Officers broke a window on the truck to see if anyone was trapped inside, but no one was found. Crews were able to turn off the flowing water from the hydrant a short time later. Police are continuing to look for the truck’s driver, but a description was not immediately provided.